In early August I took a trip down to Lewes with my family to visit Charleston Farmhouse, the home of Vanessa Bell and Duncan Grant between 1916 until their deaths in 1961 and 1978 respectively. Bell and Grant were members of the Bloomsbury group – a close knit circle of friends who were artists, writers and intellectuals. The group went on to form the Omega Workshops - a design enterprise which in addition to offering a wide range of individual products for the home such as fabrics, furniture, murals, mosaics and stained glass, offered interior design schemes for various living spaces. 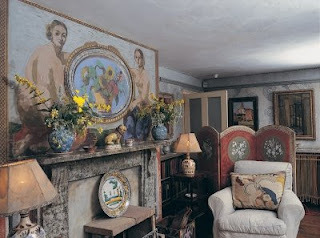 I first visited Charleston as an art student when it opened to the public back in the late 1980s and I remember being blown away by the interior of the house, which was painted by the artists throughout their residency. I recall thinking how wonderful it must have been to have had the liberation to paint and decorate every surface within the home and how fun and liberal life must have been for the occupants of the house. I imagined that one day I would be in a position to decorate my own house in the same way and even returned home to my parents house one weekend and painted a giant vase of flowers on my bedroom wall - this has since been covered by my parents choice of William Morris wallpaper and subsequently a good few coats of vinyl matt emulsion in an eggshell blue! Kaffe Fassett used Charleston as his location for the wonderful images in ‘Kaffe Knits Again’ and I will be tutoring two workshops there on November 4th 2010.